The Japanese government welcomes the recently released US defense strategy because it rebalances the strategic focus toward the Asia-Pacific region. But the other focus of this new strategy — the so-called anti-access, area denial (A2/AD) capabilities of China which, the United States fears, could jeopardize its forward presence and freedom of action in the Western Pacific — does not get as much attention from Japan. But the other pillar of this new strategy, which is to maintain the credibility of US power projection capabilities in the face of the rapidly growing A2/AD threat, is seldom talked about in Japan. The recent development of an anti-ship ballistic missile by China, which is called an “aircraft carrier killer” or “game changer,” draws special attention in the United States as a weapon system that could drastically enhance China’s A2/AD capabilities. Foreign Minister Gemba Koichiro is the only Cabinet minister who openly mentions “A2/AD.” He told a news conference Feb. 8, when he announced the agreement with the US government to delink relocation of Marine Corps Air Station Futenma in Okinawa from the rest of the base realignment package, “Deterrence could arguably be enhanced, because, for example, the entire Asia-Pacific region could work together to deal with A2/AD challenges.” He stopped short of describing A2/AD as a threat to Japan, nor did he mention Japan’s strategy to counter such military capabilities. But this is more than his personal judgment. It seems to be an institutional attitude on the part of Tokyo, if not a conscious decision. Japan’s highest-level defense strategy, “National Defense Program Guidelines (NPDG) for FY 2011 and Beyond,” does not contain a reference to A2/AD. Nor does the midterm defense program for FY 2011 to 2015. Neither document refers to Air-Sea Battle (ASB), an operational concept that the US Air Force and Navy have been developing to counter A2/AD challenges by integrating capabilities in an unprecedented way. The NPDG characterizes the main security challenge for Japan as “gray zone disputes” — confrontations over territory or economic interests that do not by nature escalate into war. It advocates the build-up of a “dynamic defense force” to deal with them. Although China is referred to as “concern for the region and global community,” and a deployment shift of Japan’s Self-Defense Forces to “the southwestern region” is discussed, China’s A2/AD capabilities are not clearly perceived as the major security challenge to Japan. This is a stark contrast with US strategic guidance, which highlights Project Power Despite Anti-Access/Area Denial Challenges as a main mission for US armed forces. It names China and Iran as states that “will continue to pursue asymmetric means to counter our power projection capabilities.” Since the United States is trying to reshape its joint force by 2020 and expects friends and allies like Japan to play a larger role, this perception gap regarding A2/AD could present a serious challenge if both countries are to converge defense strategies. ASB grabbed the attention of Japan’s defense community when it debuted in the US Quadrennial Defense Review (QDR) in February 2010. The reference to “anti-access and area denial capabilities” in QDR wasn’t new — but ASB was. But a long silence followed the ASB’s debut. The next official words came more than a year later. In November 2011, the Defense Department (DOD) announced the stand up of the ASB Office and that development of this concept would now enter the implementation phase. The concept statement was completed, they said, but it has not yet been released. Even the government-to-government level briefing lagged. This lack of clarity left Japan confused and frustrated. The word “joint” has a special, powerful meaning for the US military. According to the Department of Defense Dictionary of Military and Associated Terms, “(It) connotes activities, operations, organizations, etc., in which elements of two or more Military Departments participate.” According to the definition, “the Air-Sea Battle concept” is “joint” by nature. Then, why these changes? Some in the US defense community speculated that these changes were indications of a “downgrading” of the ASB concept as a result of an inter-service turf battle between Air Force/Navy vs. Army/Marine Corps. In addition to these changes in wording, the magnitude of the historic defense spending cut in the United States added to uncertainty surrounding the future of this new operational concept. At one point, some Japanese government officials were discussing if this concept was dead or alive. Japan and the rest of the region had to wait until a magazine essay by both Gen. Norton Schwartz, Chief of Staff of the US Air Force, and Adm. Jonathan Greenert, Chief of Naval Operations, was published Feb. 20 to feel the strong pulse of this concept again and learn more specifics. Within the Japanese government there was also hesitation to make China an enemy by signing off on a new operational concept at such an early stage. But now that the US has virtually declared that A2/AD is the primary challenge to US power projection capabilities and that the ASB concept would be implemented to counter this challenge, there is not much room left for Japan to hold off its decision. 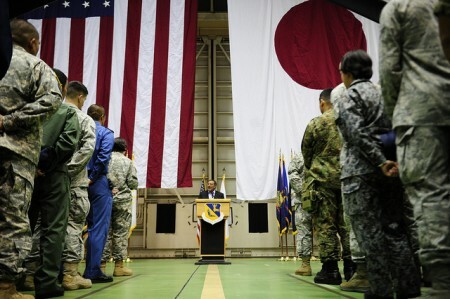 Both governments have started negotiations to work out a new agreement on base realignment in Japan. They will also talk about the more fundamental topics of “deepening the alliance” to go through this time of strategic transition. In 2010, one of the top defense strategists in Tokyo indicated that the absence of A2/AD and ASB in the NDPG did not matter much because what Japan would and could do were apparent regardless of this US new concept, he said. He identified the following steps: (1) hardening existing bases; (2) enhancing anti-submarine warfare (ASW) capabilities; and (3) ballistic missile defense (BMD) capabilities. Some of the A2/AD challenges can be dealt with by these three initiatives. They do not, however, address newer additions, such as cyber- and space attacks. Another Japanese government official points out that Japan has become a “front-line state” in its true sense, facing challenges directly from China across the East China Sea and being in an area where the operational access of US forces could be limited or even denied. That makes it necessary for Japan to come up with its own “front-line state defense strategy” beyond jumping on the bandwagon of US regional strategy. Japan can no longer avoid discussions about A2/AD challenges both within the country and with its only treaty ally, the United States. What is questioned, however, is not just Japan’s response to the Air-Sea Battle concept, but more fundamentally Japan’s comprehensive strategy toward China. Yoichi Kato is the National Security Correspondent of The Asahi Shimbun. A version of this article originally appeared in The Asahi Shimbum AJW, 9 March 2012. This article was cross-posted from The PacNet, a newsletter from ISN Partner Pacific Forum CSIS.